ARTIFACT: This is a large Pratt & Whitney patch for the back of a factory flight suit or jacket. Pratt & Whitney was founded in 1860 in Hartford, Connecticut. Before becoming an aviation company. one of their earliest products was guns for use during the Civil War. 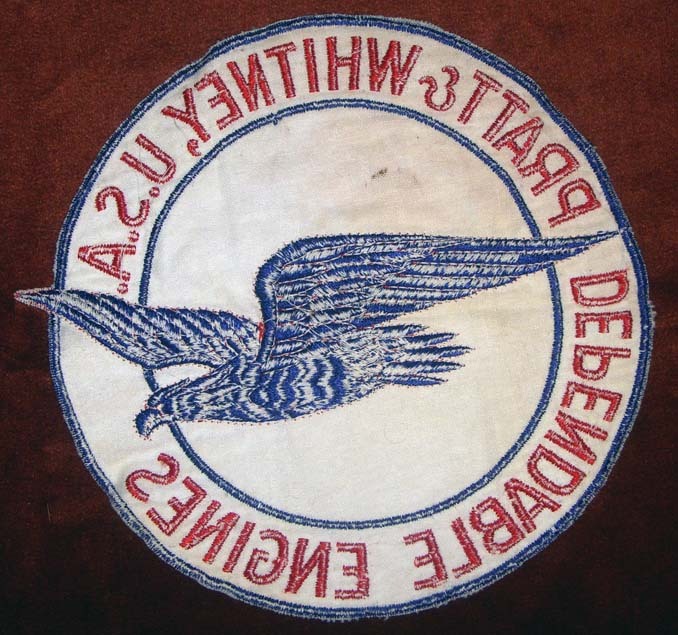 The patch dates from the 1930s through World War II era. It shows an eagle in flight and reads PRATT & WHITNEY U.S.A. DEPENDABLE ENGINES. SIZE: Approximately 8-7/8� in height and 9-1/4� in width. CONSTRUCTION/MATERIALS: Brushed twill embroidered in cotton/silk threads. CONDITION: 6+ (Fine-Very Fine): The patch shows some light to medium wear and has a few small stains on the front.